The 2018-2019 Varsity competition will be hosted by Cambridge in May 2019. Each year a Varsity DanceSport Match is held between the Oxford and Cambridge university teams. The host university alternates, with Cambridge hosting in odd-numbered years. The match is held in the third term of the academic year. 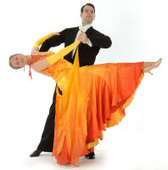 In addition to the main team matches (DanceSport A and B in Waltz, Quickstep, Cha-cha and Jive; and the RnR contest), there are open contests for dancers at various levels of proficiency. Beginners events are for those who only began dancing after last varsity and there are also restrictions on steps and clothing (not competitive dress). Non-team events are for couples where both partners are currently students but neither partner is competing in a team event nor has ever danced in an Advanced open competition on the university circuit. There are no step restrictions and competitive dress may be worn. DanceSport is recognised by the Blues Committees in both Oxford and Cambridge. As of 2016, the sport has discretionary Full Blue status for both men and women in Cambridge. In Oxford, it has Full Blue status for women and discretionary Full Blue status for men.